Shamil Basayev’s brother appeared and disappeared in Helsinki within a day. Indeed, it was worth watching. It still is. Basayev’s name has been a symbol of terrorism in Russia for more than a decade and it stays so even after Basayev’s death. So the news about a trial in Finland on «a citizen of Finland and a citizen of Turkey» excited nobody in Russia. But the news about a trial on Basayev’s brother in Finland was reported by Interfax news agency and copypasted by dozens of Russian media. Russian search engine Yandex gives at this minute 38 000 pages to the search «брат Басаева суд Финляндия» (meaning «Basayev’s brother trial Finland»). Not all pages actually tell about the trial but quite many indeed. 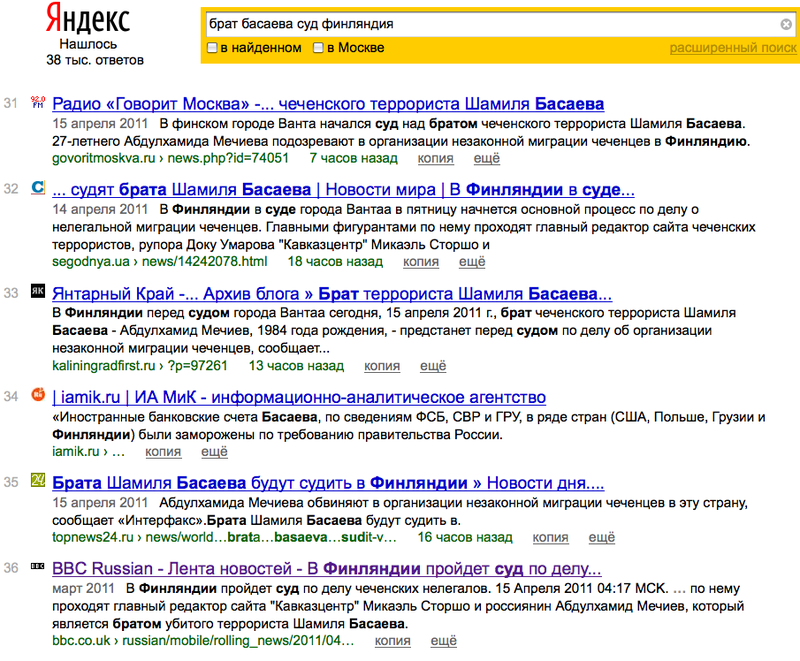 The news actually were published on the web twice: «trial is to start», «trial is over». Interfax even translated the news to English – « Brother of slain Chechen warlord Shamil Basayev to face trial in Finland» – what a shame, world media didn’t catch it. If it is a report in Russian then «Basayev» is surely in the headline. Some media referred to a Finnish political author Johan Bäckman who claimed he saw the name «Basayev» in the trial documents, others mentioned just «trial documents». So far I actually didn’t see a single report in Russian with quotations by a representative of the court, by a prosecutor or by the «brother» himself. The trial might be interesting for some people, it is a case about illegal immigration of Chechens to Finland. The accused one, Finnish businessman Mikael Storsjoconfirms the facts but says he helped Chechens on humanitarian basis and wasn’t paid for that. Immigration service gives political asylum with the same motivation, that’s Storsjo’s argument. Indeed very many Chechens moved to different European countries, they survived two wars during two last decades! But this is not about Chechens or Storsjo. It is about Basayev’s brother who is on trial in Helsinki. I am based in Helsinki so of course in the morning I ran to the Vantaa court near Helsinki. The hearing was in Swedish because Mikael Storsjo is a Swedish-speaking Finn and Swedish is an official language in Finland. The judge, the prosecutor and lawyeers did mention «Storsjo», and some other names (of the immigrants, I suppose) but – to my surprise – no «Basayev». Why did I come here at 9am? -There is a young man near Mikael Storsjo. Is he a brother of Shamil Basayev? -But there were reports that he admitted it. -I can’t say anything about his relatives but there is no name of Basayev in the legal case. But I can ask the brother, can’t I? According to the Russian media reports, his name is Deni Berkat (and earlier he was called Abdulkhamid Mechiev). Should I believe the media? Well anyway I don’t know his real name, I didn’t check his passport. -Are you Shamil Basayev’s brother? The guy looked realy surprised and later he came to me in the corridor and asked again: who said I am Basayev’s brother? I showed him dozens of reports in Russian on my phone’s screen. -Basayev’s brother is in Turkey! -And you are a Russian citizen? -But your Russian is so good! -My English and Chechen are good, too. Should I mention that Finnish press was laconic about the hearing? A short report in the main newspaper, that’s all. And no Basayev there! What a surprise. 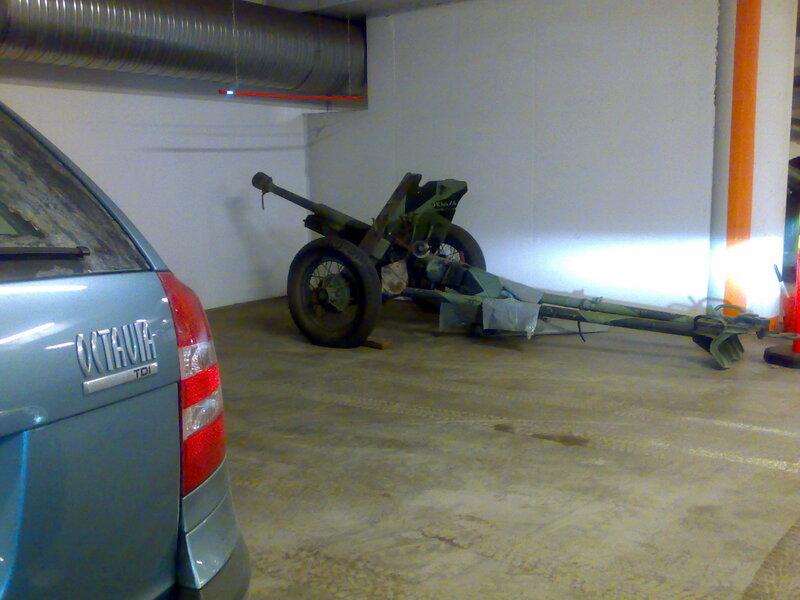 The only thing I am happy about: not all Russian media reported about Basayev’s brother in Finland. Somebody just ignored the news. Or checked it and saw that there was no brother at all.